During one of our recent 'end of day' hand-off conversations, Dear A, quietly mentioned that K had used some "bad words" while they were out. I was mortified. Horrified. 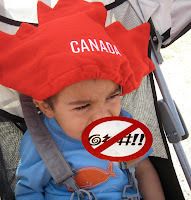 Not about K's potty-mouth - I’m well aware that we, Captain F-Bomb and Mrs Sh*tSh*tSh*t, have spawned a 2 year old with a pretty colourful vocabulary and the wherewithal to use it. Nope, I was mortified that Dear A, our polite, church going, never utters a harsh word, nanny, had been out in public with K, King of the Swears. I guess they’d been at the library and after dropping a book off the shelf K had very clearly stated, “Oh Sh*t!” When reprimanded, he burst into tears, melted into a tantrum and generally caused a scene. Dear A comforted him, calmed him down, and moved him along to another activity. Later that same outing, when he slipped at the mall play park, K dropped the F-Bomb. So, mortified me listened, as Dear A reported, and then offered that we could perhaps all work on using the alternative “Oh Shucks!” I sheepishly thanked her and quickly changed the subject to the next day’s plans. Now I just have to convince Captain F-Bomb to swear with a weird lisp. PS - Go Canada Go!! Oh my goodness, thanks for the laugh. I have been trying to quell my own potty mouth during my pregnancy, but realized during a meltdown yesterday that I have had limited success. (My hubby had a dream that our kid came out cursing - our talking newborn's first sentence was "Sh*t dad, be careful!") So I look forward to trying your Dear A's suggested "Oh Shucks"! This is great! I am right there with you... For older first time parents used to freely cursing, this has been quite switch.